Just imagine for a second: a five-star hotel in St. Petersburg, spring is behind the window, you’re in love and feel a thousand butterflies fluttering inside you. Well, you have fallen into the Romantic Dimension of the Domina St. Petersburg! To help you experience these moments of happiness and excitement again and again, we mix our creative cocktails in the emerald-blue rooms of Bar Nove, located on the second floor of the hotel. And how many love stories await you inside! All you have to do is reach for the bookshelf. Does everything new, mysterious and incomprehensible attract you? Climb up to the third floor and open the door Dimension of Fantasies! This is the land of art, magic and surrealism, which is inside a five-star hotel in St. Petersburg. Here the shelves house Vian and Wilde, while the bar serves creative cocktails to send your imagination flying. Be sure to ask the concierge about upcoming workshops and meetings with St. Petersburg celebs that we host at the hotel. You probably have latent creative potential that is just waiting for the right moment to spring up! To us it means happiness, bounty, optimism, children’s smiles and laughter! That’s why we love when families come to visit.  Domina St. Petersburg is a family hotel, and St. Petersburg is an ideal city for a family visit. We have created an atmosphere where you and your family will enjoy full comfort, reading your favourite books, playing board games together, or going for a walk through the city. Ask for the kid’s menu at the Arcobaleno restaurant and see what surprises we have in store for the young ones. The naturally inspired rooms and suites of the five-star Domina St. Petersburg have been crafted for tranquil, comfortable respite. The blue and graphite colours of the rooms will set your mind at ease. Get closer to nature. Do some yoga in our wellness centre or simply peruse albums of landscape paintings to find your inner peace. Close your eyes. Breath in. Listen. Do you hear the birds singing someone nearby? Start your search with the Adventure Dimension on the seventh floor of the hotel. Deep maroon tones, dizzying adventure novels and movies will have you feeling great and get your blood pumping. And it’s possible without even getting out of bed! If you are up for a walk, don’t miss the Arcobaleno restaurant, which has all kinds of exciting culinary discoveries in store. To reveal your imagination we invite you to private tour at Yousupov palace and Mikhailovsky Castle – both full of secrets and legends.